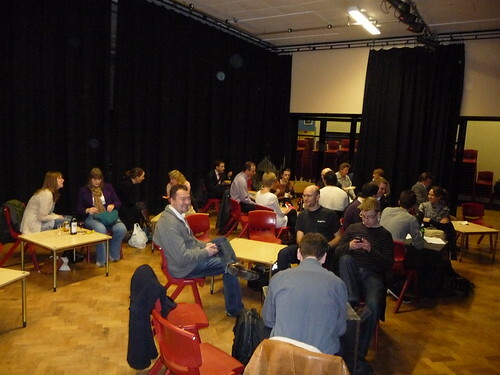 On 15th Feb 2011 I attended a Pecha Kucha night organised by Simon Strong of Human Zoo in Guildford. Pecha Kucha is an excellent format where presenters have to talk over 20 slides that auto advance every 20 seconds. The beauty of Pecha Kucha is that you can fit a large number of presentations/talks into one evening without it feeling crammed or letting your brain explode. This time there were talks about many things including satellites, film making and Japanese culture. It wasn’t until the day that I realised two friends, Benjamin Ellis and James Firth were presenting there that day too. Simon will be organising more of these events in the future and I recommend checking them out.